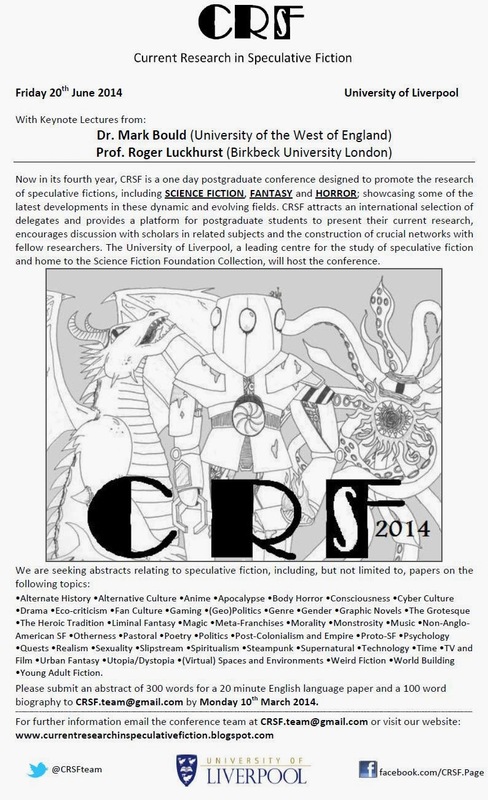 The Call for Papers for Current Research in Speculative Fiction 2014 is now here! The conference will be held on Friday 20th June at the University of Liverpool. We are proud to be able to announce two brilliant keynote speakers with Dr. Mark Bould (University of the West of England) and Prof. Roger Luckhurst (Birkbeck University London), both will be giving lectures as part of the conference schedule. Please submit an abstract of 300 words for a 20 minute English language paper and a 100 word biography to CRSF.team@gmail.comby Monday 10th March 2014.